Not for beginners. This will give fantastic shaves if you know how to use light touch and with correct blade. I recommend the Grande version instead of normal. Grande has better longer handle and it is still not too heavy. This razor needs attention when you use it. If you have heavy hair growth this is the correct razor for you. This is a serious razor and one that requires a gentle touch but used sensibly it provides a very close and surprisingly comfortable shave. The size and weight of the larger handle makes it easy to control. The only downside, if it is one, is that it is not the razor to use if you are in a hurry. gives a good shave, but i would not recomend using it daily, i think you would end up with discomfort – or you would/could go thru a tube/tub of balm in a couple of weeks . Ok now to the nitty gritty, an open comb is also termed a rake, due to the way the comb resembles teeth on a garden rake . If you look at other open comb designs, they all echo the same design feature – this razor does not . Examine the comb section and you will notice the scalloping is infact on a bar . Lesson over – btw i have the “grand” version – i have big hands . A finely engineered razor with good balance and weight. Having upgraded, I’m taking time to adjust but this does not detract from Muhle quality. I may buy the alternative head, however, as this open comb head is proving challenging! Different blades may help and will persevere as I’m a total convert to DE shaving – as well as Shave Lounge whose service is outstanding and personable which is rare these days! Far too early to assess but looks great feels good happy so far. Cannot find a fault with service quality and look of this shaver. A completely different animal to the R98G. Not as aggressive as the earlier models, this post-2013 version is just an excellent shaving machine and can slice through even a 7-day growth with ease. I found the R41G pairs very well with the sharper blades (Feather, Gillette yellow, Astra, Voskhod) and it’s now my go-to razor – treat it with respect and you’ll be rewarded. The 1st few weeks with this razor and I could understand the ‘aggressive’ label it is given. I had moved up from the milder R89, which is good. The R41 needs time but you grow to love it. Feather blades were just over the top for me and I now favour Wilkinson Sword blades. The lightest touch is required and time but you are rewarded with a great shave. I enjoy using this razor and am so glad I gave it time. Highly recommended. this thing is a weapon. you’ll feel the blade against your face so ZERO pressure. 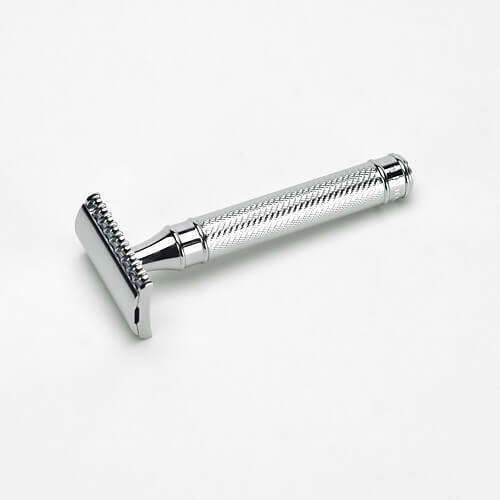 if you want the classic BBS shave this is your razor. I’ve now matched with Astra SP’s and it’s all good. This is my 2nd DE razor, I bought a Merkur 37C slant bar last year as an intro to DE shaving. The Muhle R41 Grande is awesome, it slots together perfectly each time with exactly the same blade edge showing on either side, and the blade is locked solidly in place. I’ve not had any razor burn/nicks/cuts/claret leaks at all (learnt from those mistakes with my first couple of attempts last year with my 37C). It sounds like I’m applying a carpenters rasp to my face when using the R41 and that can be a bit disconcerting to begin with, but what a shave. Take your time and this beauty will reward you with a chin as smooth as a babys bum, I got that in 2 passes (1 with & 1 against the grain) the first time I wielded this particular excalibur in anger. I only use Feather blades in both my razors, I’ve tried Derby, Astra, Lord, Shark, Treet, Gillette 7 o’clock & W/Sword in my 37C and preferred the feel & finish from the Feather’s. Buy one and take it steady, you won’t be disappointed.